Annually, from 3 to 6 Kamchatkan volcanoes produce eruptions, during which the explosions eject ash to 10-15 km a.s.l., and ash clouds spread thousands of kilometers from volcanoes. Ash clouds pose a serious threat to the modern jet aviation. Scientists of KVERT have conduct daily monitoring of Kamchatka volcanoes since 1993, to mitigate volcanic hazards to airline operations and population. Since 2014, satellite monitoring of volcanoes they carried out with the VolSatView (Remote monitoring of active volcanoes of Kamchatka and the Kuril Islands) (http://volcanoes.smislab.ru) IS. The system utilize all the available satellite data, weather and video observations to ensure continues monitoring and study of volcanic activity in Kamchatka. 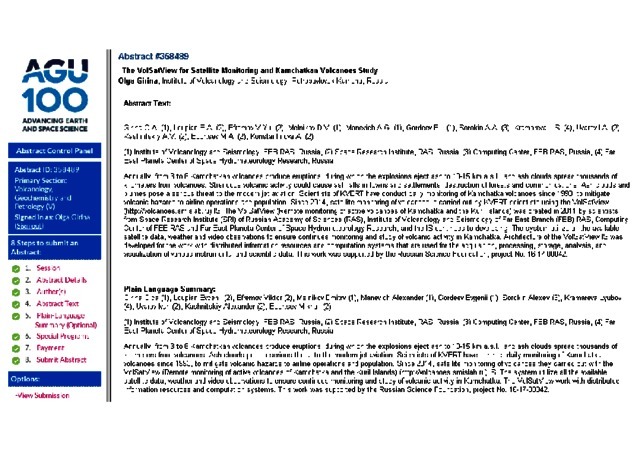 The VolSatView work with distributed information resources and computation systems. This work was supported by the Russian Science Foundation, project No. 16-17-00042. Girina O.A., Loupian E.A., Efremov V.Yu., Melnikov D.V., Manevich A.G., Sorokin A.A., Kramareva L.S., Uvarov I.A., Kashnitskii A.V., Bourtsev M.A., Marchenkov V.V., Mazurov A.A., Malkovsky S.I., Romanova I.M., Korolev S.P. 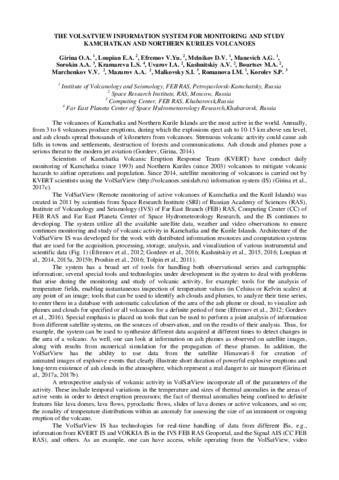 The VolSatView information system for monitoring and study Kamchatkan and Northern Kuriles volcanoes // 10th Biennual workshop on Japan-Kamchatka-Alaska subduction processes (JKASP-2018). Petropavlovsk-Kamchatsky, Russia, August 20-26. Petropavlovsk-Kamchatsky: IVS FEB RAS. 2018. P. 77-79. The active andesitic Zhupanovsky Volcano consists of four coalesced stratovolcano cones. The historical explosive eruptions of 1940, 1957, and 2014‒2016 discharged material from the Priemysh Cone. 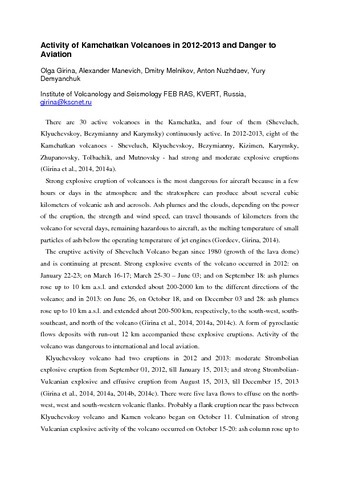 The recent Zhupanovsky eruptions were studied using satellite data supplied by the Monitoring of Active Volcanoes in Kamchatka and on the Kuril Islands information system (VolSatView), as well as based on video and visual observations of the volcano. The first eruption started on October 22 and lasted until October 24, 2013. Fumaroles situated on the Priemysh western slope were the centers that discharged gas plumes charged with some amount of ash. The next eruption started on June 6, 2014 and lasted until November 20, 2016. 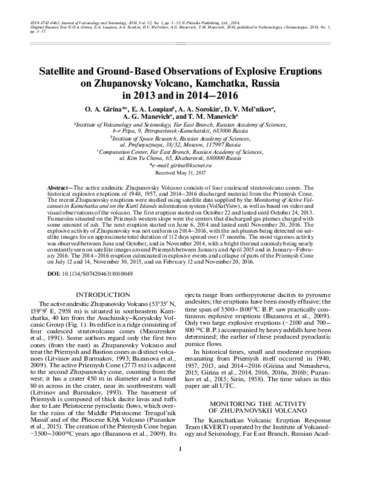 The explosive activity of Zhupanovsky was not uniform in 2014–2016, with the ash plumes being detected on satellite images for an approximate total duration of 112 days spread over 17 months. The most vigorous activity was observed between June and October, and in November 2014, with a bright thermal anomaly being nearly constantly seen on satellite images around Priemysh between January and April 2015 and in January–February 2016. The 2014–2016 eruption culminated in explosive events and collapse of parts of the Priemysh Cone on July 12 and 14, November 30, 2015, and on February 12 and November 20, 2016. There are 30 active volcanoes in the Kamchatka, and several of them are continuously active. 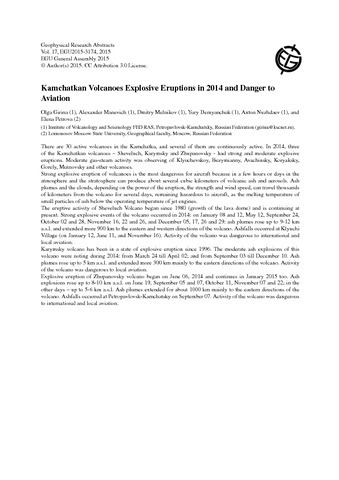 In 2014-2015, four of the Kamchatkan volcanoes (Sheveluch, Klyuchevskoy, Karymsky and Zhupanovsky) had strong and moderate explosive eruptions. Strong explosive eruption of volcanoes is the most dangerous for aircraft because in a few hours or days in the atmosphere and the stratosphere can produce about several cubic kilometers of volcanic ash and aerosols. Ash plumes and the clouds, depending on the power of the eruption, the strength and wind speed, can travel thousands of kilometers from the volcano for several days, remaining hazardous to aircraft, as the melting temperature of small particles of ash below the operating temperature of jet engines. Annual Kamchatkan strong explosive eruptions with ash emissions by 8-15 km above sea level represent a real threat to modern jet aviation. To reduce the risk of aircraft encounters with volcanic ash clouds in the North Pacific region, since 2002, KVERT IVS FEB RAS conduct a daily satellite monitoring of 30 Kamchatkan volcanoes and visual and video monitoring of Klyuchevskoy, Sheveluch, Bezymianny, Koryaksky, Avachinsky, Mutnovsky and Gorely volcanoes. 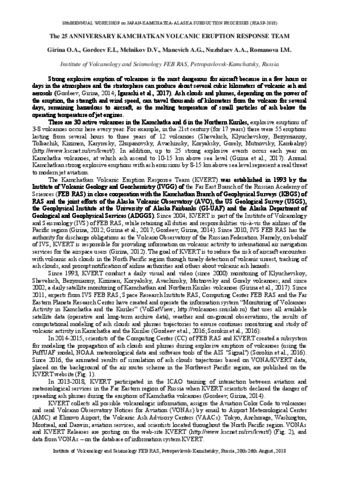 KVERT analyses seismic data for 9 volcanoes (Klyuchevskoy, Sheveluch, Bezymianny, Tolbachik, Kizimen, Karymsky, Koryaksky, Avachinsky and Gorely) from the Kamchatkan Branch of Geophysical Survey RAS. Since 2011, experts from IVS FEB RAS, Space Research Institute RAS, Computing Center FEB RAS and the Far Eastern Planeta Research Center have operated the information system “Monitoring of Volcanoes Activity in Kamchatka and the Kuriles” (VolSatView; http://volcanoes.smislab.ru) that uses all available satellite data (operative and long-term archive data), weather and on-ground observations, the results of computational modeling of ash clouds and plumes trajectories to ensure continues monitoring and study of volcanic activity in Kamchatka and the Kuriles. 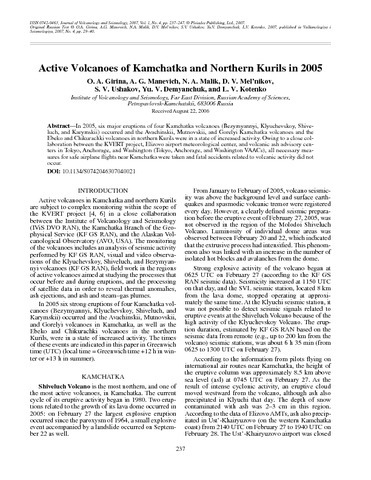 In 2005, six major eruptions of four Kamchatka volcanoes (Bezymyannyi, Klyuchevskoy, Shiveluch, and Karymskii) occurred and the Avachinskii, Mutnovskii, and Gorelyi Kamchatka volcanoes and the Ebeko and Chikurachki volcanoes in northern Kurils were in a state of increased activity. Owing to a close collaboration between the KVERT project, Elizovo airport meteorological center, and volcanic ash advisory centers in Tokyo, Anchorage, and Washington (Tokyo, Anchorage, and Washington VAACs), all necessary measures for safe airplane flights near Kamchatka were taken and fatal accidents related to volcanic activity did not occur. 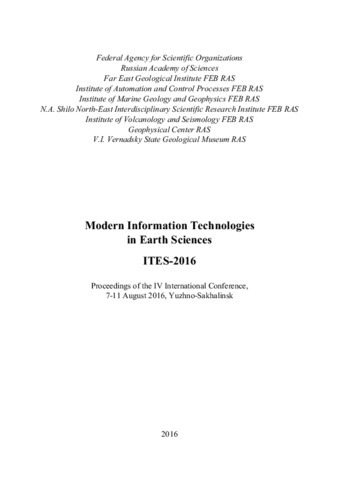 Girina O.A., Manevich A.G., Melnikov D.V., Nuzhdaev A.A., Demyanchuk Yu.V. 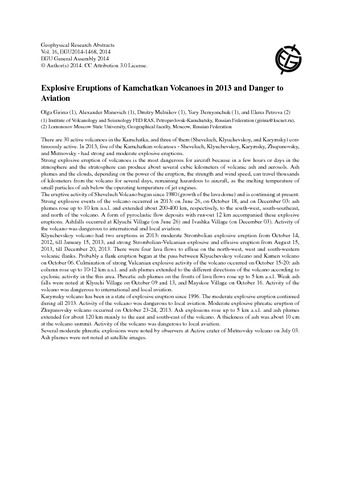 Activity of Kamchatkan Volcanoes in 2012-2013 and Danger to Aviation // Abstracts. International Workshop “JKASP-8”. Sapporo. Japan. September 22-26. 2014. 2014.